Naim ND5 XS review | What Hi-Fi? Streamers may be the new popular kit in town, but Naim has an advantage after getting into the game early. If you want true high fidelity music from a multi-talented streamer, it remains one of the best in the business, as the £2250 ND5 XS proves. With native Tidal support now added to its very long list of features, the ND5 XS is a stunningly capable streamer no matter what kind of music you throw at it. Feed it well-recorded, high-resolution files, however, and it shines. Kate Bush’s 50 Words For Snow (in 24-bit/96kHz) bursts through with confidence and authority like no other. Each lilt and inflection of her vocals is enunciated through the streamer with startling precision. It’s a stunningly balanced and dynamic presentation, with seemingly no limit to the highs and lows it can reach. The treble is rounded off a little at the very top to combat any undue brightness. However, it’s not at the cost of any excitement or detail. Nina Simone is still allowed to belt her vocals out and Tom Waits has his rasp intact. Similarly, the bass performance is taut and textured – it goes satisfyingly deep, while retaining an energetic and nimble character. While the Naim is revealing enough to show up a poor quality recording, its smooth touch will soften the blow somewhat. The ND5 XS handles delicacy and muscle when needed. Timing is precise, with every instrument working cohesively in a carefully controlled soundstage. It never sounds too analytical, though. Radiohead’s challenging arrangement in 15 Step is one of our favourite test tracks, and the Naim takes it in stride. Snappy and tightly woven, it’s a toe-tapping performance. The ND5 XS has an effortless quality to it, and given the appropriate partnering equipment, it flourishes. Naim’s sturdy black chassis, minimalist design and crystal clear display have an elegant, premium-quality feel to them. The supplied remote control looks smart and feels natural to use, with buttons laid out logically and the menu responding instantly to any presses. Track information is sharp and easy to read on the Naim’s punchy display. But for the complete experience, we’d highly recommend using Naim’s slick iOS/Android control app. It’s perfect for scrolling through vast libraries of music stored across multiple sources, and switching between sources, queueing up playlists and choosing radio stations or Spotify playlists becomes utterly intuitive when using a tablet’s large and speedy interface. 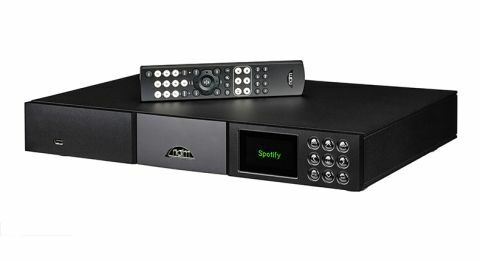 As for specifications, this Naim is kitted out with just about every streaming feature worth having. The Tidal update joins Spotify Connect and vTuner internet radio, opening up a world of music and radio stations for your enjoyment. The ND5 XS is a fully UPnP player, meaning that it will play just about anything you can connect to it. That includes songs stored across NAS boxes, laptops and smart devices. Simply connect the ND5 XS to your home network (it’s stable across wi-fi and wired alike), and you’ll be able to stream all popular file formats up to 24-bit/192kHz high-resolution, including DSD64 tracks. It also has aptX Bluetooth on board for easy streaming from a smartphone or tablet. You’ll find a decent spread of analogue and digital connections, too. Optical and two coaxial inputs (one of which has a BNC plug) joins a pair of analogue outputs, a DIN connector and another BNC output on the back panel. Finally, the USB port on the front panel will not only charge your smart device, but it will also play stored songs from an Apple device or a memory stick. Everything about Naim’s streamer has been carefully planned out to make it as seamless as possible to use. It’s a very forward-thinking approach from an established hi-fi company, and coupled with its brilliant sonic performance, this ND5 XS is a must-have if you’re after a truly high-end streamer that can do it all.